Living in Seattle definitely has its perks when it comes to finding a unique wedding venue. Many of the city's old rustic industrial warehouses in the SODO, Fremont, Ballard, and West Seattle neighborhoods are being transformed into one-of-a-kind spaces perfect for hosting both intimate and large wedding parties. Exposed piping, cement, and brick on the walls and ceilings create stunning distressed and trendy wedding photography backdrops. Some of these spaces fully embrace their modern interior design vibes by adding in distinctive design elements that set them apart from the other venues. The Foundry by Herban Feast has wooden chandeliers hanging from the ceiling, as well as large sliding barn doors that open and close, perfect for hiding the wedding room flip! Multiple sky lights allow natural sunlight to enter the venue during the daytime, minimizing the need for additional lighting! An amazing team of vendors came together to create wedding inspiration for a rustic indoor wedding reception with a modern twist. Guests are first welcomed into the reception room by a giant clear acrylic seating chart. Diagonal copper borders break up the large space to create different areas for table numbers and attendees' names to be written. After they find their name, guests find their seat at one of the gorgeous reception tables. The copper chargers and clear ghost chairs give the whole tablescape a fresh, approachable look! 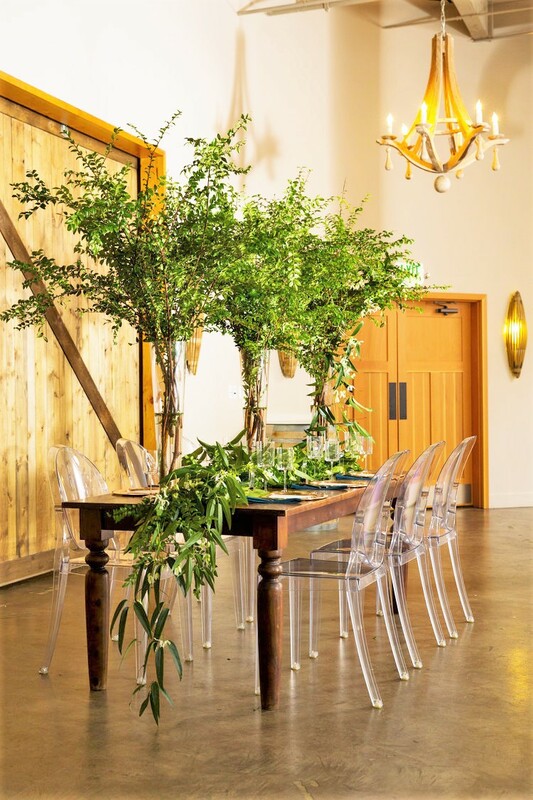 We decided to bring the outdoors inside by lining the wooden farm table with tall, lush tree branches in clear hurricane vases that created the illusion of a hanging floral installation without breaking the bank! Opt for doing overly tall centerpieces in the middle of the table so that your guests can still see through to the other side. This reception reflects modern trends down to the tableware by asymmetrical placement of the triangular napkins, geometrically-shaped dinner menus, and unconventional box-shaped wine glasses. The matte black flatware is so cool and clean, serving as the perfect finishing touch to these classy, modern table settings. Lastly, how adorable are the wedding invitations?? The capitalized wording on the teal, white, and copper stationery suite adds to the elegant simplicity of these branded paper goods. Copper diagonal lines moving across the paper subtly mirror the lines seen on the acrylic seating chart, which is oh too perfect! !